The Wabbit gathered with his close associates in a secret location to discuss the peril of the Ice Mice. "OK everyone," said the Wabbit. For a while he poked the stolen disk with a collapsible mono pod that he kept in his fur. "Ghost Bunny! What do you hear? What do you say?" rapped the Wabbit suddenly. "Don't poke the disk, Wabbit. It's a weather weapon," murmured Ghost Bunny in the Wabbit's ear. "You don't say?" said the Wabbit, rolling the disk back and forward. "Wabbit, that is an Active Ice Underground Tool - or AIUTO if you will," explained Ghost Bunny. "Help!" smiled Lapinette. "Got it!" said the Wabbit. "Look Skratch, these flying saucers. What's the word in the Turin porticos and pasticceri?" "They think a film crew is making a movie," said Skratch quickly. "There's a rumour that it's called the Italian Job in Space." "I hate remakes," said the Wabbit. Everyone shook their heads sadly. "Now Lapinette," said the Wabbit. "I need good ideas quickly." "Give them a taste of their own weather," said Lapinette. "and turn their weapons against them." "The disks are rather unstable. It's a bad idea," said Ghost Bunny solemnly. "Has anyone got a worse one?" asked the Wabbit. 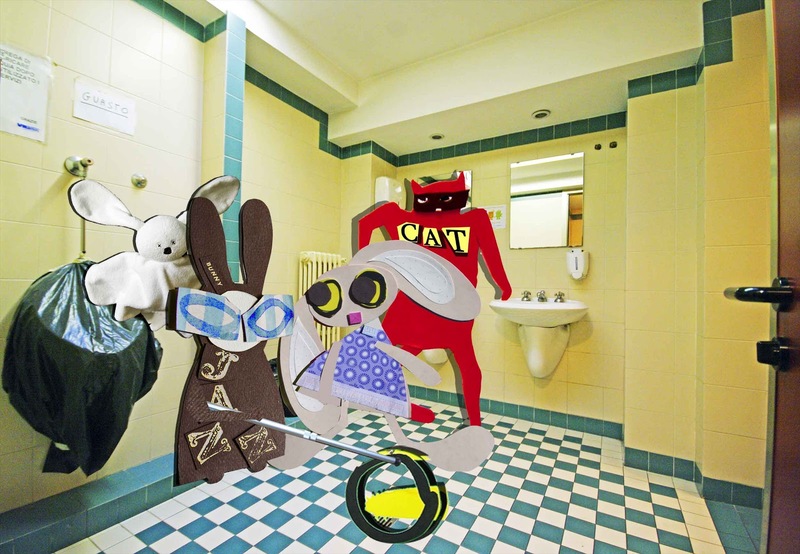 Everyone looked puzzled and in the confusion the Wabbit took the opportunity to enforce his choice. "We'll run with Lapinette's idea," he said. "Ghost Bunny, I need reverse disks and plenty of them." "Right away, Commander," sighed Ghost Bunny. "When do we start?" said Lapinette. "Immediately," said the Wabbit, "weather permitting."